Honolulu is in the midst of a light rail versus bus rapid transit debate. Above the Orange Line's Reseda Station. Photo by Dan Reed, via Flickr creative commons. In this opinion piece, Supervisor and Metro Board Member offers his perspective on a light rail versus bus rapid transit debate that is ongoing in Honolulu. And he doesn't mince words, explaining that he fought for the Crenshaw/LAX Line to be light rail because of several advantages he believes it holds over bus rapid transit. In particular, it's faster, more reliable and would do more to elevate the quality of life in neighborhoods near the line. Ridley-Thomas also says that in Los Angeles, the Orange Line was a good option because it was built on an existing rail right-of-way and didn't disrupt existing streets. But he says the Orange Line has also offered some lessons — it's slower than he said was promised (only reducing travel time by 29 seconds per mile, he says) and it has to deal with too many intersections (unlike grade-separated trains). Pretty interesting read! Of course, many light rail lines — including the Crenshaw/LAX Line — will still have to deal with at-grade crossings, although many of Metro Rail's crossings are gated. In the case of the Crenshaw/LAX Line, about half of the line will be below ground or on aerial structures — one reason the budget for the project is $1.75 billion. The Star-Advertiser requires registration in order to see articles. Even with a lawsuit from homeowners in the Cheviot Hills area before the state Supreme Court, construction is visible at many sites on the Expo Phase 2 route. Their mission: making life better for walkers on streets that often were built mostly to enable automobiles get from Point A to Point B as efficiently as possible. The tools of transformation include reshaping lanes and crosswalks, changing signs and signals—anything to foster calmer corridors and reduce the “raceway mentality” that’s rampant on many streets. A brief look at several groups, including the Bus Riders Union, opposed to the ballot measure seeking to extend the Measure R half-cent sales tax from 2039 to 2069 in order to accelerate transit and road projects. You should also have factor in the long term costs of BRTs over light rail too. Buses require maintenance like tire changes, oil changes, and constant fill up of natural gas just like any other vehicle on the road. It carries way less people than light rail so you have efficiency problems there too. In addition, since it carries less riders, you need to hire double or triple the amount of bus drivers that you can get by with one light rail operator. BRTs maybe cheaper to build in the short term, but you really don’t save much in the long term. Ridley-Thomas hasn’t spent too much time sitting at traffic lights on the Expo Line methinks. Expensive and slow! At least the Orange line is just slow. The difference between BRT and light rail seems to be primarily a political one, not related to the technical capability of either system. If there was political will to grade-separate the Orange Line crossings, then they would be separated. What is it about a bus tire the prevents this? Light rail takes a big cash investment and ties it to a patch of ground. Developers are willing to sink money into a neighborhood when they see that the service can’t be easily moved or re-routed. “Neighborhood improvements” aren’t related to how many people one system can carry or how fast. They are dependent on the level of trust between investment dollars and elected officials. Specifically, developers don’t trust the elected officials (or voters) until a few hundred million dollars of concrete has cured. The Expo Line would be much more faster if there were absolutely no at grade crossings. At grade crossings just make everything go slow, both light rails, car and pedestrian traffic. The only problem is aerial constructions cost too much, or at least that’s LA’s excuse for not looking at that seriously enough. LA needs to find a way to build aerials fast, reliably, and cheap. Why can’t LA build elevated structures in smaller pieces and put them together at the site instead of trying to build one right then and there? If LA can transport the big Space Shuttle Endeavour from LAX to Downtown LA, why can’t they just build mass produce aerial parts somewhere else in the city and bring them in where aerials are needed? That’s how I saw the Japanese building elevated aerials when I was stationed there. They brought in pre-built mass production aerial parts on big trucks and locked the pieces together at the construction site. They had an aerial ready to go in less than week. And this is even considering Japan is earthquake country like us! The BRT op-ed could have supported the claim of social mobility better. For example, the Orange Line has not been attributed to any private investment (LACMTA) during its 5 years of operation, whereas rail lines spur private development even before they are operational. Social mobility could also be supported by the usually increased capacity of LRT vs BRT. The Orange Line has effectively reached capacity (USDOT) and did so shortly after opening. A rail line would allow for more people to reach employment centers which are otherwise impractical for the transit dependent. With the increased capacity, also comes choice riders and decreased congestion and pollution. BRT can have a higher capacity than LRT but usually only for express service. If only Ridley-Thomas represented the 3rd district we may have been in the pipeline for a rail line. At least the Expo LRT runs smoothly and comfortably. Riding the Orange BRT is just like sitting in a bus (because it IS a bus). The main advantage that light-rail has over BRT is capacity. Most of the perceived technical superiority of LRT over buses is way overblown. The faster speeds of LRT compared to buses is mostly due to grade separation and gating at intersections. These can also be implemented on a BRT line. Electric motors have full torque from a dead stop, while internal combustion engines need to accelerate before achieving this. But, there are fully electric buses or hybrids available, so that is not a advantage exclusive to LRT. Capacity on the Orange Line BRT can be increased by having limited stop trips that involve different routes. The maximum operated carrying capacity per hour of most of the current route is sufficient. Its mainly from the North Hollywood subway station stop to Van Nuys Blvd where there is a problem with a overload of passengers. That can be improved by having two buses depart from the subway station stop at the same time, thereby splitting the load arriving from the subway. The first bus could skip some stops to take people more directly to Van Nuys Blvd and at the same time this would create a headway between it and the platooning bus which left the station at the same time. When Van Nuys Blvd is reached, the first bus would depart the busway and head north. Unfortunately, Metro wants the Orange Line busway to be operated like a train, with only the Orange Line running on it. This takes away much of the flexibility advantages that buses have over trains. Skipping stops and having more than one bus line utilizing the BRT busway would both increase its capacity while also increasing the average speed. Metro states that the Orange Line could reach maximum capacity in 5-7 years. Metro had stated that the capacity of the original 14-mile route was 40,000 passengers per day. The ridership had reached its highest paid ridership of 28,000 only one month and yet on opening day–when rides were free–it carried 83,000 passengers. That was achieved by parking buses on the street. Skipping stops and taking the buses onto the street for part of their route would also achieve much of that. Reliability is an advantage that Mark Ridley-Thomas says LRT has over BRT. A October 2011 FTA report on the Orange Line stated that it is a highly reliable service with no difference between peak and non-peak running times. The FTA report also showed that people do perceive alternative rapid transit modes differently; moreover, differences in perception appear to be independent of any particular mode or technology. However, overall ratings generally followed the relative level of investment required to provide each service. Their analysis showed a large disparity in investment level, with the Red Line costing approximately 1,000 times more than the local bus service. Yet, aside from these two obvious extremes, the ratings achieved by the remaining transit services did not directly correspond to investment levels. Both the Metro Rapid “BRT-Lite” and Orange Line “Full-Service” BRT outperform their investment costs, achieving a slightly higher rating than the light rail systems grouped within the same tier. For example, the Metro Rapid achieved a rating equivalent to the Blue Line LRT for a fraction of the investment cost per mile ($0.355 million vs. $59.1 million). Given that the investment level associated with the Metro Rapid is much closer to the local bus than to any of the other modes, it was concluded that the Metro Rapid performs remarkably well in terms of overall rating achieved per dollar of investment, and therefore represents a very cost effective form of BRT. The Orange Line achieved an overall rating that was equivalent to the Gold Line and significantly higher than the Blue Line, for approximately one-third the capital investment. This indicates that the Orange Line also performs well in terms of overall rating achieved per dollar of investment, although not to the dramatic level associated with the Metro Rapid. This study also stated that urban context of whether it goes through a wealthier or more disadvantaged area may be more influential in determining overall perceptions than whether a service is based on rail or bus technology. In terms of importance, the tangible attributes of reliability and service frequency received the highest ratings, along with the intangible attribute of ride safety. These were closely followed by the tangible attribute of service span and the intangible attribute of station safety. Overall, the study findings show that Full-Service BRT can replicate both the functionality standards (tangible attributes) and image qualities (intangible attributes) normally associated with the higher-investment LRT mode. Nevertheless, even a lower-investment BRT-Lite service such as the Metro Rapid performs remarkably well in terms of overall rating achieved per investment dollar. The heavy rail mode and the bus mode (excluding the Orange Line) are the most cost-efficient modes for Metro in terms of farebox recovery, while the light rail mode has the lowest farebox recovery, at 17.6 percent. 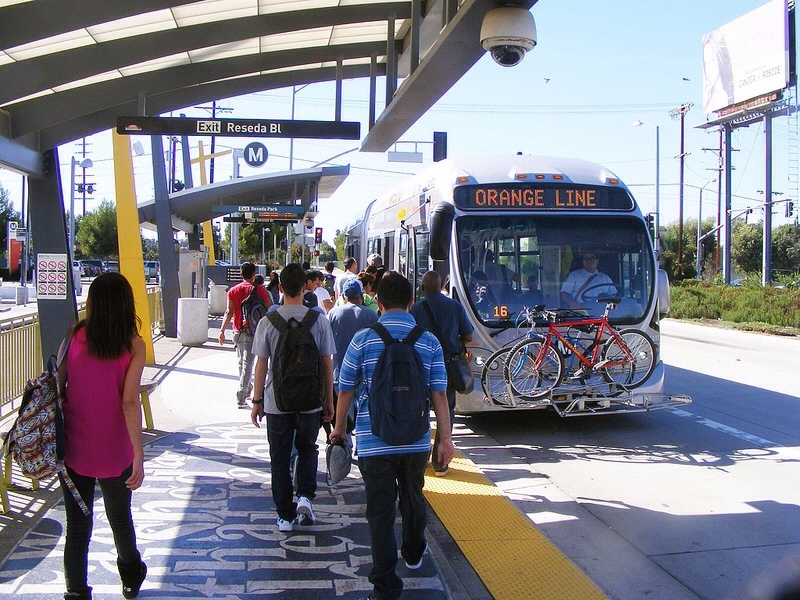 The Orange Line covers approximately one-fifth (21.2%) of its operating expenses with revenue from the farebox. You also have to factor in fare cost for low ridership numbers. People have been saying for some quite time now that LA is just too big and diverse with everyone going to so many different places short or long distances that it makes no sense to have a flat rate system. Who living near Roscoe or Canoga would consider spending $75 per month in monthly passes just to get class in Pierce College? The majority of the people using the Orange Line are those who make the transfer at North Hollywood to the Red Line. When Metro envisioned everyone would be using public transit, they never took into account of “how much it costs for the consumer to travel over certain distances.” And because they didn’t take into account that people are not going to pay $3.00 one-way to travel 5 miles because it involves a transfer or how unfair it is that a person can travel over 20 miles on one bus for a $1.50 while another who rides it for 1 block pays the same $1.50, they fail to capture those riders and pushed them to seek alternatives. And guess what increasing number of people are doing these days? They’re selling one of their cars and buying scooters instead. Also, there have been comments associated with other articles which have noted that this is an issue that extends Much further west along the Orange line than Van Nuys Blvd. It had 31,787 passengers last month and has been running at about 27,000, which is apparently substandard by the tone of your comment and this seems particularly incongruous when compared to a report that says that it is probably maxing out. Comparing light/heavy rail to buses is like comparing motorcycles and automobiles, yes this is a bad metaphor but so are the comparisons between these different forms of transportation. tl;dr: When ridership demand is present, rail out performs tires. @ Dennis: Express service is the largest advantage of buses over rail. It allows for them to carry more people than LRT and at a fraction of the cost of HRT. However, express service would have the adverse affects of limiting the usefulness of signal timing as the line cannot handle anymore traffic without either essentially shutting down cross traffic, or taking the efficiency of signal priority down from the current 80% and thereby increasing end to end travel times (from the same report you sighted). Crossing arms are not an option as they are illegal for bus lanes, and physical grade separation (bridges and tunnels) would increase the cost to that of rail without the benefit of attracting private investment and choice ridership. Express service would also decrease the perceived reliability of the bus route, taking it from the current urban transit model, where you know a vehicle is coming in ten minutes no matter when you show up (a part of the orange line’s success), to an express commuter model where you learn the schedule and make your bus or you’re late for your destination. There should be express services to and from the Red Line, but than that is not the Orange Line. That is an express route and normally the domain of LADOT, not LACMTA. One thing often missing from economic analysis of public transit are the gains of not having people idle in the cars for hours a day. Much like the benefit of the highway system isn’t measured in gasoline taxes or the cost to build freeways, but in being essential to the US having one of the world’s highest GDP per capita. What would be the societal benefit of an extra 20+ thousand people being able to take the orange line to work instead of driving? Would that offset the increased capital cost of rail? The idea I presented of increasing capacity by introducing a limited stop route would be in addition to the current Orange Line buses. This would involve having a route that duplicates the idea of the discontinued 902 line, which was to relieve the two highest load points of the Orange Line at the North Hollywood station and the Van Nuys Blvd station. This time though, it would run on the Orange Line busway from the North Hollywood station and then proceed up Van Nuys Blvd. This bus would leave the North Hollywood station every ten minutes at the same time as the Orange Line buses. This would divide the heavy load of passengers coming from the subway train, which stops every ten minutes. So, instead of people having to wait for the next bus due to crowding, then having to get off at Van Nuys Blvd and wait for another bus, they could have a more direct, faster and more consistent service. This bus should have a distinctly different color to make it easily distinguishable for passengers, lets say chartreuse, and it would be the lead bus. The Orange Line bus would platoon behind this bus up from the North Hollywood station until the next stop at Laurel Canyon Blvd. Then the Orange Line bus would stop at this station and the chartreuse bus would not. This would start to create a headway between the two buses. If Metro follows the old 902 route, then the next stop for the chartreuse bus would be at Valley College. This stop is only a problem for the Orange Line when students leave the campus in mass. The bus would skip the Woodman ave station and proceed to Van Nuys Blvd. There would rarely be any leap-frogging between the two lines due to the chartreuse line having fewer passengers and skipping at least half the stops between the subway and Van Nuys Blvd. Although, during peak hours the chartreuse line should have a significant amount of passengers between these two points. According to page 59 of the FTA report, the only other maximum load point problem for the Orange Line going westbound, at the time that the chart was produced, is in the morning up at the Woodley Ave station. That is probably due to Birmingham High students riding to the Balboa Blvd station (notice how the passenger load drops off at the Balboa station). This load point problem can be relieved by adding one additional Orange Line bus trip during this time. The route for the chartreuse bus going east would be in reverse order of the westward trip. This would reduce the load point at Van Nuys Blvd, providing more frequent and direct service for those passengers traveling along Van Nuys Blvd to the subway. Metro is doing a study about different options for improving service along the Van Nuys Blvd/Sepulveda Blvd corridors. If a upgrade to BRT is chosen by the Metro board, then this idea I presented for having an additional route along the Orange Line busway would have another added benefit. The 761 rapid line which goes from Pacoima down Van Nuys Blvd to Westwood has a big reduction in its passenger load south of the Orange Line. By introducing a 10-minute interval of service for this new BRT busway from Pacoima to Ventura Blvd and then having another 10-interval service that starts from the North Hollywood station, then there would be two overlapping 10-minute services along Van Nuys blvd from the the Orange Line to Pacoima–which would be service frequency of every 5-minutes along this section of Van Nuys Blvd–then service every ten minutes south of the Orange Line on Van Nuys Blvd. This would increase service along the Orange Line busway between Van Nuys Blvd and the North Hollywood station and also increase the frequency of BRT service along Van Nuys Blvd from the Orange Line to Pacoima. There would be a small increase in operational cost due to the greater distance from between Van Nuys Blvd to the North Hollywood station compared to going from the Orange Line to Ventura Blvd along Van Nuys Blvd. Also, the passenger count for the Orange Line in September includes the 4-mile extension to Chatsworth. Its to be expected that there would be a increase in ridership compared to the previous year when this extension did not exist. Again, previously Metro estimated that the maximum capacity of the original 14-mile Orange Line was 40,000 and that they would probably reach that in another 5-7 years. I talked to a Metro bus routing manager at a recent community outreach for the north/south transit corridor improvement project and he also told me that the Orange Line is not at maximum capacity yet. Another possibility to increase capacity is to get longer buses. Currently, the maximum length allowed for a bus in California is 60-feet and it has to have a hinge in order to make sharp turns. There are double-hinged 80-foot buses widely used in South America and in Europe. A 93-foot double-hinged bus with a capacity of 253 passengers just went into service in Dreden Germany. It may be possible for Metro to get an exemption to the rule since these BRT buses for the SFV will mainly run on exclusive right-of-ways. There is also a maximum weight allowed per axle and extending the length without adding another hinge would violate that rule. Metro got an exemption for a 65-foot bus which they have had in the Orange Line fleet for over two years. The manufacturer was able to keep the weight the same as the 60-foot buses by removing some gas tanks. The problem is that the additional passengers can violate the maximum weight allowed per axle. Bogata Columbia runs 80-foot buses along their Transmilenio BRT trunk line and it has a passenger count per mile that is much greater than the LA subway. There is a BRT modeled after Transmilenio in Guangzhou China, which handles 200,000 passengers a day. The maximum capacity of a well designed BRT busway is much greater than what many people believe. Again, the main difference between heavy rail, light-rail and buses is not the technology, its their capacity. The time when a city transit service should chose to install a train is when they need a really, really long bus to accomodate the passenger load. A 60-foot bus is not a really, really long bus. Grade separation of BRT would not increase the cost to that of light-rail. Using non-graded installations, LRT is at least 3-times more expensive per mile than BRT. Flexibility is the greatest advantage that buses have over rail. If a bus breaks down and blocks the busway or if the road has to be resurfaced, then the buses can be rerouted to the street. This has happened several times for the Orange Line. If a train breaks down or the track needs to be repairs, then train service is delayed. Also, as the passenger loads increase along a BRT busway, then is likely enough riders to make a more direct route between two points by eliminating some stops. This is the case for the two stops of Van Nuys Blvd and the North Hollywood station for the Orange Line at peak hours. You simply could not skip some stops for every other train running along a single track. Buses have the advantage here. The only way to add a capacity on the Orange Line is if you can successfully platoon them between North Hollywood and Van Nuys on the orange Line. You mention that your “902” and the 901 start in a platoon configuration then proceed to separate after Laurel Canyon creating a headway. This would create a section of the line where headways could potentially be lower than 4mins, which would most likely get a big no from LADOT since they are extremely hesitant to hamper cross traffic along the Orange Line in anyway. I’ll begin by noting that you continue to ignore the FTA report. Your earlier comment stated “The maximum operated carrying capacity per hour of most of the current route is sufficient..” which was a (selective) half paraphrase of the FTA report that also went on to state “…it is NOT ADEQUATE at maximum load points. Even if Metro increases its current load standard, the demand-to-capacity ratio would still be approaching 1.0, indicating that system capacity may be MAXING OUT…”. I do not doubt that you have put much thought into this, but your idea of running a concurrent bus along a portion of the Orange line would REQUIRE that the project that Metro builds on Van Nuys Blvd be a BRT so that it could handle the large buses. You do not explicitly state that in your response above but lets be clear, it ASSUMES BRT on Van Nuys otherwise your running at best Metro Rapid buses. Despite this I still think my earlier points are valid. Your idea of concurrent service and bigger buses also ignores that the FTA report you cite which states: “Even if Metro increases its current load standard, the demand-to-capacity ratio would still be approaching 1.0, indicating that system capacity may be MAXING OUT…”. Despite your well meaning, it appears you have a bias to BRT. Comparing light rail with buses using only a cost benefit analysis stuck in the Reagan years is not a conducive argument especially when your FTA report states it appears that buses are maxing out and load points are inadequate. Your argument that we should build bigger buses is LOL. I went to the community meetings on the Van Nuys blvd corridor and an aide to a councilman asked the Metro reps about the concern that the City of LA has on the timing of the lights on Van Nuys Blvd and all you heard was crickets. We won’t have to worry about leapfrogging buses when they are stuck behind each other in traffic. Just read your other reply to @AD. Your reply about using non-graded installations is comparing apples and oranges, @AD was using grade separated guideways. It is true that trains breakdown, but buses breakdown too! I saw a stranded bus recently on Mason Ave near Devonshire St. Without medians, busses on dedicated busways crash head-on, unfortunately. This happened in Pittsburgh a few years back. To avoid this, they move more slowly, thus diluting their very usefulness. You seem to be ignoring some of what the paragraph on page 30 of the FTA report says. It states: “In 2007, the agency also ordered a prototype 65-ft bus that increases capacity by 20 percent to meet the demand. The axle weight of these vehicles, however, has delayed acquiring the regulatory waivers required to operate on the roadway.” The bus manufacturer extended the length of one of the two sections of the single hinged 60-ft bus to create a 65-ft bus. That put an additional load on existing axles of one section. Keeping the load per axle down, while keeping the bus manueverable, longer dual hinged 80-ft buses are widely used in Asia, South America and Europe and there is also a dual-hinged 98-ft bus that is now being tested in Dresden Germany which has a capacity of 256 passengers. These longer buses do violate the maximum 60-ft bus length allowed in California, but Metro could get an exemption if and when they decide to purchase higher capacity buses. There is also the possibility of changing the law so that exclusive BRT right-of-ways are allowed longer buses. The next sentence in the report states: “Although the maximum operated carrying capacity per hour on the Orange Line is sufficient along most of the route, it is not adequate at maximum load points. Even if Metro increases its current load standard, the demand-to-capacity ratio would still be approaching 1.0, indicating that system capacity may be maxing out (see Section 4, subsection “Capacity”). Reducing headways further is not a realistic option, as TSP would become ineffective.” I pointed out that the maximum load points tend to be at the Van Nuys and North Hollywood stations. Relieving those two stations was the whole idea behind the 902 line that ran parallel to the Orange Line on Burbank Blvd between these two points. I’m essentially advocating that same idea is added to the Orange Line busway. Although this would bring the headway between the two buses down below 4 minutes, this is something that occurs already with the scheduling four minutes apart during peak hours. The next line of this paragraph on the FTA report states: “Other strategies that Metro may consider include bus platooning and providing limited-stop trips.” Thats where my idea of adding another route onto the Orange Line busway comes in. This would reduce the passenger count per bus below the maximum load point at the North Hollywood and Van Nuys stations. Those are the highest load points in the six peak hours during a weekday. The FTA report also does a cost-benefit analysis of BRT to light-rail and to rapid buses. This report wasn’t done during the Reagan era. Your response indicates that you didn’t read the several pages of the report where this was mentioned at length. There is not much chance that the Orange Line will be converted to light-rail in the near future. The biggest possibility would seem to hinge on Measure J being approved by voters in November and the Metro board deciding to use some of this sales tax to build it. My so called bias towards buses is trying to work within the reality of the situation. Its much more likely that the Orange Line will remain BRT and that Metro could get an exemption for longer buses than it is for the Orange Line to be converted to light-rail. In fact, its also much more likely that Van Nuys Blvd will have a BRT line running down the middle of it, than it would be to have a light-rail. Thats simply due to the limited money and time frame that Metro has to complete the East San Fernando project along this corridor. This project could be upgraded to light-rail if Measure J passes, but that would mean moving the completion date back several years as Measure J was designed to speed up long term projects and the ESFV project is not one of them. A news resport from a tv station in Hawaii got a telephone interview with UCLA professor Brian Taylor on the merits for choosing BRT or rail for that state. Even though the projected ridership is over three times that of the Orange Line he thought it would be a better choice to go with BRT. Taylor told KITV4 rail systems often get mired in politics, as elected leaders point to shiny new rail lines as status symbols for their respective cities. Taylor said with bus rapid transit, the system can expand as demand for public transportation increases. However, he cautions the cost of such systems tend to escalate with the construction of exclusive lanes for express buses. Taylor’s research shows one of the greatest factors in determining a transit system’s appeal is the ease with which riders can get to a transit line, whether it’s BRT or rail. If a rider needs to go through various steps like walking, driving or transferring to get to a final destination, the less likely he or she is to use public transportation. “So, making the vehicle a little bit faster is not nearly as important as having a cutting down of the wait time,” he said. If there is a limited stop route added to the Orange Line and the East San Fernando Valley corridor project along Van Nuys Blvd is built as BRT, then the wait time for passengers and transfers will be reduced for those traveling between the North Hollywood station and Pacoima. The FTA report is saying that reducing headway (by adding buses) would not by realistic. I understand that you want to add buses that are up to 98 feet long to increase capacity and your certainly entitled to that opinion. Indeed the FTA report mentions “strategies” such as limited stop trips and bus platooning and feel that my other comments have addressed those issues. But please keep in mind that these are strategies and not offered as a cure and that these strategies may run into trouble with headways and more general traffic management. The problem with headway for the Orange Line is described in the FTA as centering on the ability of the transit signal priority (TSP) system to function properly. That’s why the report mentions the possiblity of platooning buses or skipping stops to overcome that limitation for increased capacity. On page 5 of the report it states: “To accommodate the anticipated additional riders (due to the addition of the Chatsworth extension), Metro is considering different strategies, such as bus platooning, where multiple buses travel in a convoy; adding additional “tripper” buses that are deployed at times when passenger loads are high; and providing limited-stop trips.” My suggestion fits in with what Metro is considering to improve the capacity on the Orange Line. Also, I don’t really have a bias towards buses. I just try to look at it as finding the technology that will meet the need, rather than the other way around. The type of transit should not be chosen based on emotional response and that is the way transit planners should work. Rail vehicle appearance inside/outside, fare payment, stations, electric propulsion and exclusive right of way can all be duplicated by BRT. The amount of room around doors for light-rail can also be mostly duplicated on BRT by removing seats that are directly opposite the 2nd and 3rd doors on the 60-foot buses. Starting on page 46, the FTA reports mentions results from a National Bus Rapid Transit Institute study that interviewed 2,400 transit and non-transit users in Los Angeles about the tangible and intangible differences between different transit modes. The findings show that people do perceive the various rapid transit modes differently, but the differences in perception appear to be independent of any particular mode or technology. The tangible service qualities included door to door travel time, travel cost, frequency of service, hours of service, frequency and reliability of service. The Orange, Gold and Blue line received comparable tangible ratings. comfort, and perceptions of other riders. Overall, the study findings show that Full-Service BRT can replicate both the functionality standards (tangible attributes) and image qualities (intangible attributes) normally associated with the higher-investment LRT mode. The main tangible differences between light-rail and BRT would be some ride quality and capacity. Those attributes requires an increased capital cost of at least three times more for light-rail compared to BRT. Resources to accomplish this are finite. Spending these much greater amounts of money to pursue rail over BRT in order to get small improvements other than capacity takes away from using that money towards giving better service elsewhere in the system. The broad generalizations and condescending tone throughout your comments are too bad. I point out reasons why your scheme will probably not work out and have additionally pointed out that you have ignored points in the FTA report and did not fully quote entire sentences because they only hurt your subjective opinion being expressed here. I could offer a differing point of view to your last two posts but your attack on me as having a bias just underscores your own unreasonableness, well, that and you can’t acknowledge any mistakes. You express your opinion as though it were a fact and continue to expound on buses and generalize the issues in such a way as to praise BRT on the Orange line without even acknowledging any potential flaws in the scheme you presented. I have said buses and trains are different forms of transportation and that is literally true yet you claim that I have a bias. With that kind of reporting on your part it is no wonder why you are left with attacking the messenger and not really addressing the issues. Go ahead and please have the last comment, I know you want it, and I hope other readers have noted the extreme to which you hold a point of view.